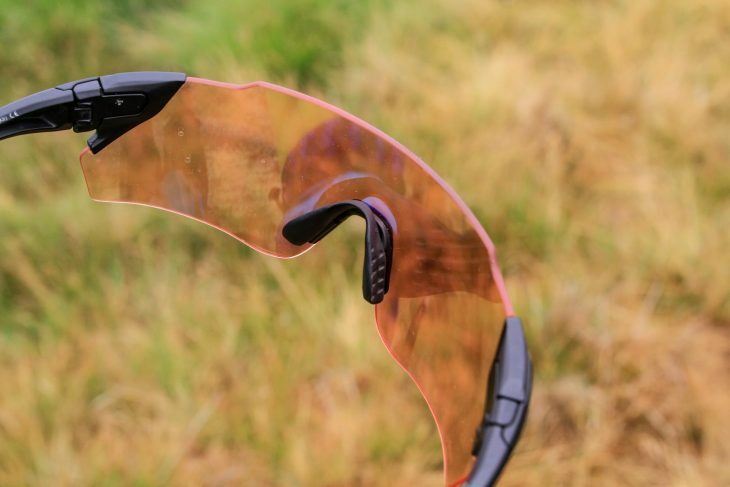 Adding to its growing line of performance eyewear targeted at cyclists, last year Smith Optics debuted the all-new Attack and Attack Max sunglasses. 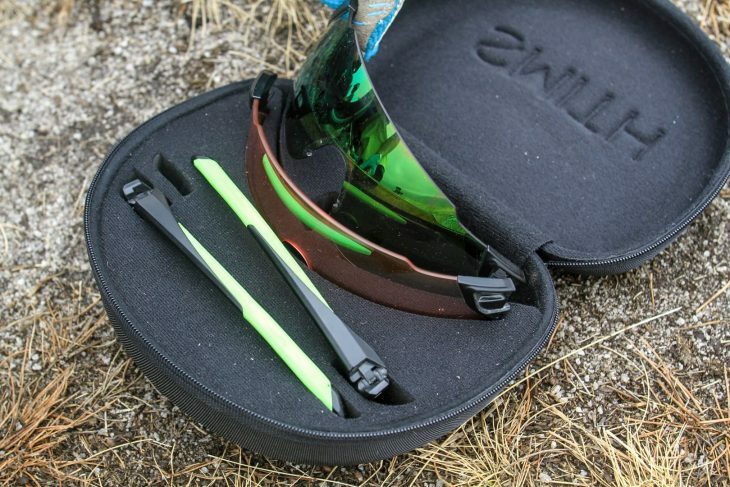 Joining the PivLock Overdrive and PivLock Arena – glasses that we’ve got on very well with in the past, the Attack range consists of a large coverage single-piece lens and a clever quick release system for changing the arms and nose piece from one lens to another. 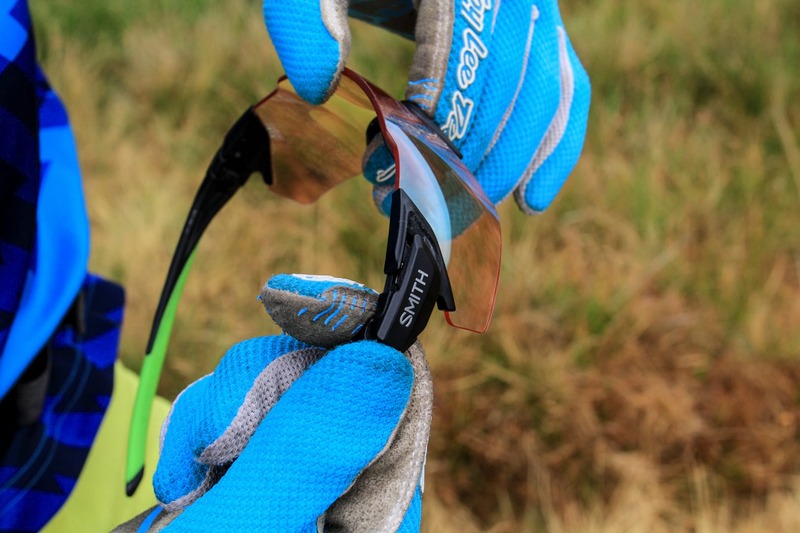 The Attack Max glasses are new from Smith, and they come with ChromaPop lens technology. The lenses also come with Smith’s proprietary ChromaPop technology. We’ve covered ChromaPop in a separate article that you can read here, but in a nutshell, ChromaPop consists of two separate layers sandwiched in the makeup of the lens, that are designed to filter out specific wavelengths of light – the ones that supposedly cause colour confusion for our tiny brains. 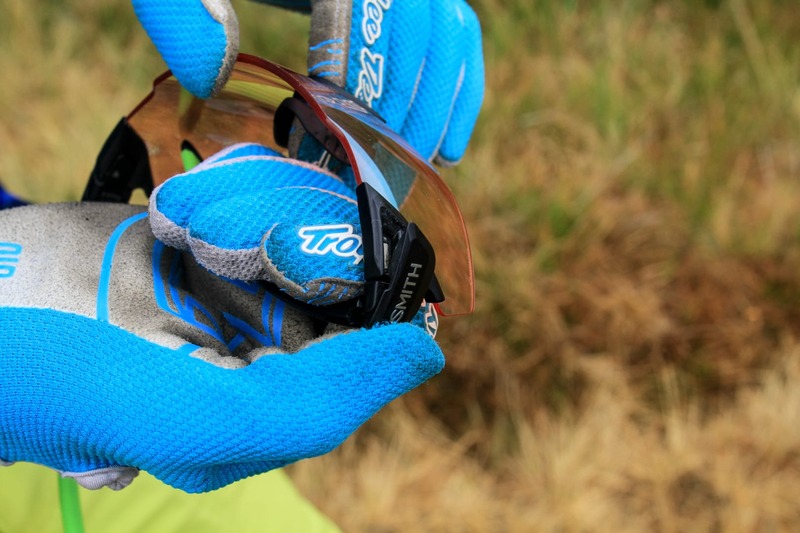 The goal is to provide sharper and clearer vision with more contrast, so that it’s easier to pickup irregularities on the trail. All I gotta say is that for nearly 200 squids, they had better make everything look bloody amazing. The field of vision on the Attack Max glasses is absolutely huge. 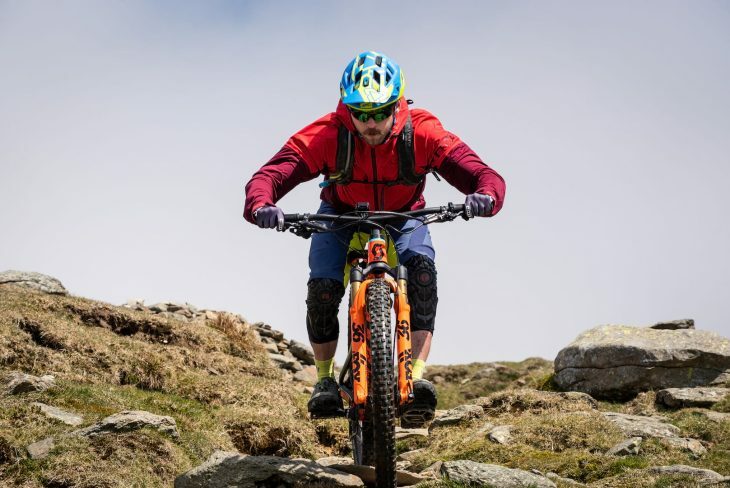 The Attack and Attack Max glasses share identical features, with the difference between the two simply boiling down to size – the Attack Max tested here gets a larger lens that measures 125mm wide by 53mm tall. In comparison, the standard Attack lens measures 125mm wide by 47mm tall, so it’s just a little shallower in profile. Combined with the near-frameless construction, the field of view with these is incredible. 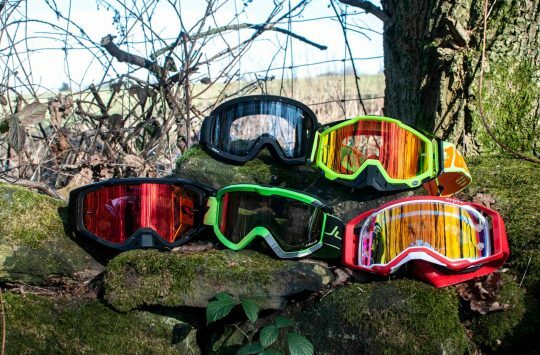 In fact, there’s even more coverage than the enormous Adidas Evil Eye Evo Pro glasses I’ve also used, which were my benchmark up until now. 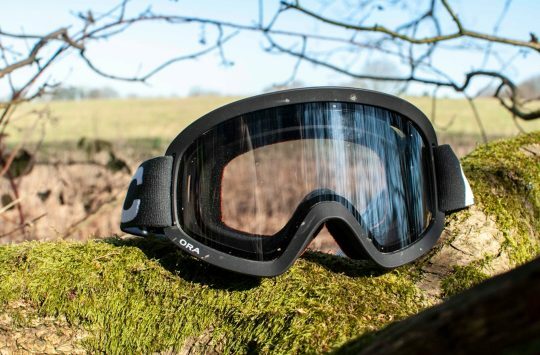 Because the Attack Max lenses are pretty much frameless, there’s less obstruction to your field of view though, and that puts them ahead of the Evil Eye Evo Pros. The Attack Max glasses’ party trick is the quick-release arms, which use a magnetic latch to connect them to the outside corner of the lens. Normally this sort of thing would feel a bit gimmicky to me, but I have to say it is the easiest lens-swapping design I’ve ever come across. With the arms folded, you just push the latch to open it up, pull on the arm, and it disconnects from the lens. When reattaching the arm, the magnetic clasp joins to the lens with a satisfying ‘click’ as it locks in place. 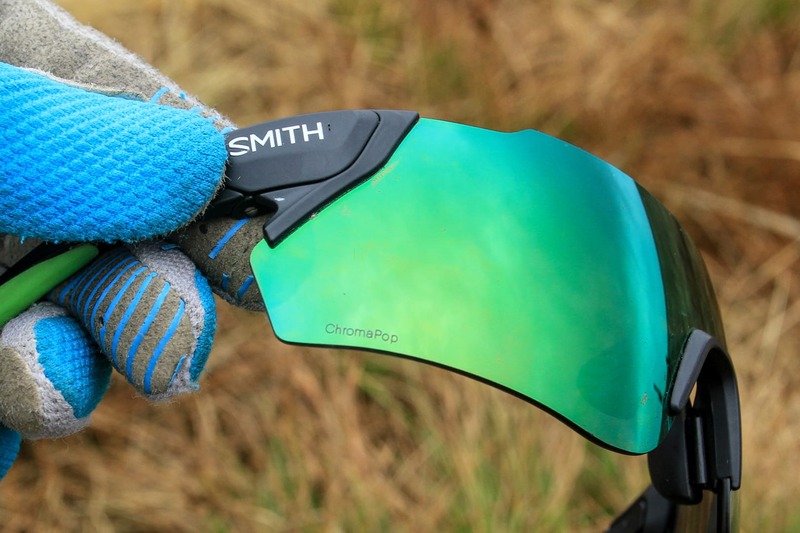 It certainly makes most other lens-changing systems, and indeed Smith’s own PivLock glasses, look quite rudimentary in comparison – those aforementioned models require a more forceful twist-to-unlock procedure that kind of feels like you’re about to break something. Push the magnetic latch to open it up. And off it comes – couldn’t be easier. When changing lenses, you also remove the nosepiece by simply pinching it together with your finger and thumb. To fit it to a different lens, just push it up into the central bridge, before it clicks into place. The nosepiece itself is made of the same grippy rubber that lines the inside of both arms, which helps to keep it place on your face even when sweaty. It also has a two-position adjustment, so you can alter where the lenses sit on top of your nose. Push the nose piece in and it clicks into place. The pads have two positions for getting the lens set in the right position. I’ve been testing two sets of Attack Max glasses; one with a ChromaPop Platinum lens, and one with a ChromaPop Green Mirror lens. Both share the same 15% VLT rating, which refers to the amount of visible light that is transferred through the lens, and into your eyeballs. A darker lens tint will have a lower VLT rating, while a lighter lens tint will have a higher VLT rating. Both of these lenses are built using the same grey base lens. It’s the layers on top of that that vary, and according to Smith, the Green Mirror one is supposed to maximise clarity, while the Platinum lens is better for high glare scenarios. For bright summery conditions, the ChromaPop Platinum lens provides excellent glare reduction. Photo: Jens Staudt. I’d concur with Smith’s claims. I took the Platinum lens with me to Moab back in May, where we were faced with very bright conditions, as well as light-coloured sand and rock that reflected a lot of light back up from the ground. The Platinum lenses were superb. They’re crystal clear, with exceptionally good glare reduction, though they don’t seem to dampen out the colours or mute any tones. Combined with that huge coverage, my eyes felt more than sufficiently protected from the elements, without feeling like I was peering through a pool of murky brown water. In comparison, I’ve found the ChromaPop Green Mirror lens to offer more vibrancy – kind of like looking at the trail via an Instagram filter. 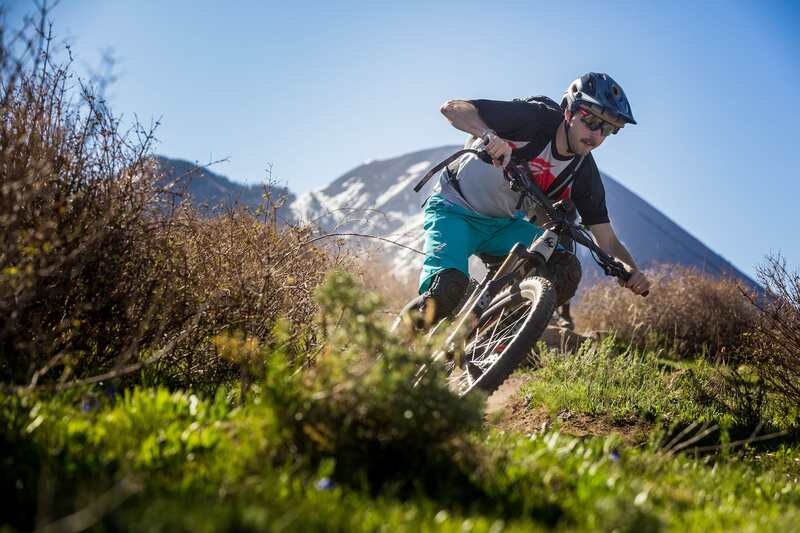 This is ideal on backcountry rides that traverse grassy meadows and through wooded singletrack, where the colours are noticeably enhanced for better contrast – you get excellent definition of trail textures. 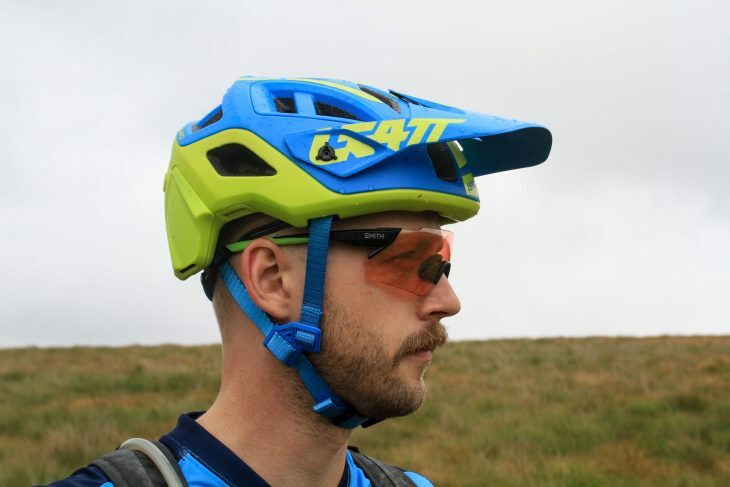 It isn’t quite as good at cutting out the really high glare stuff, but to be honest, for year-round riding in the UK, this is the lens option I’d go for. I preferred the Green Mirror lens though, especially for more common UK conditions. Photo: James Vincent. Of note is that both lenses have proven very effective at shedding sweat and water droplets. 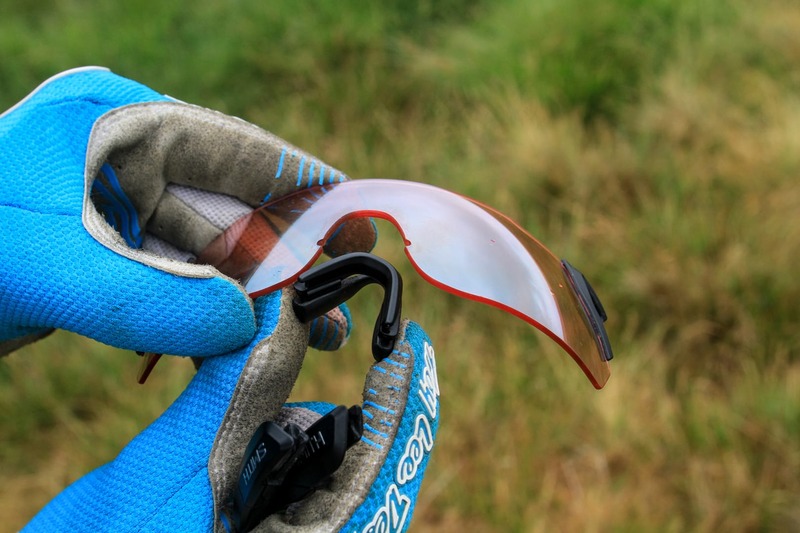 Even on hot days where my eyebrows have doused the inside of the glasses with beads of sweat, the Attack Max lens does well to quickly disperse moisture, without leaving greasy streaks behind. Likewise, I find I can still wear these even when I’ve been caught in a rain shower – water just doesn’t seem to bead up on them. At the end of the ride, a quick rinse in some water and a wipe with the included microfibre cloth is all that’s needed to return them to their clean and shiny original state. And even though I’ve been guilty of wiping them while they’re still muddy (you shouldn’t do that with any glasses) they’re still yet to suffer any noticeable scratches, which is impressive. 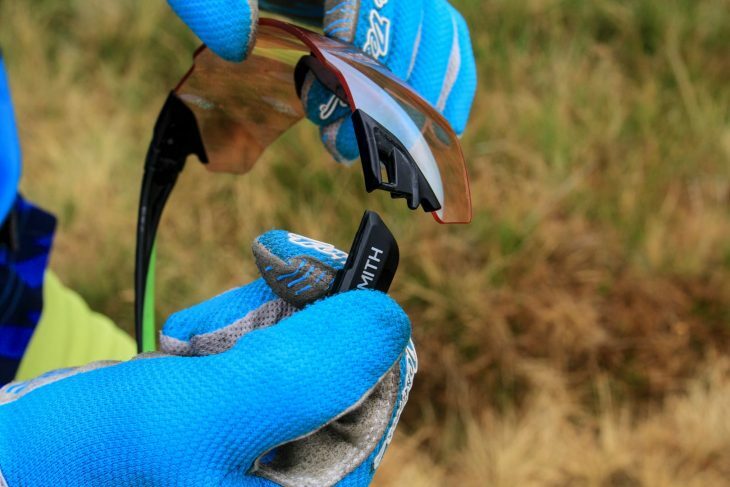 Regardless of the primary lens you select, each pair of Attack and Attack Max glasses comes with a second lens in the case. This is a lightly tinted lens called the ChromaPop Rose Flash Lens, and it has a much higher VLT of 48%, making it better suited to intermediate conditions. The custom case is nice, though you do have to remove the arms from the lenses. I both like and dislike this lens. I like it because it’s superb for grey days out on the bike – something that us British mountain bikers encounter pretty frequently. 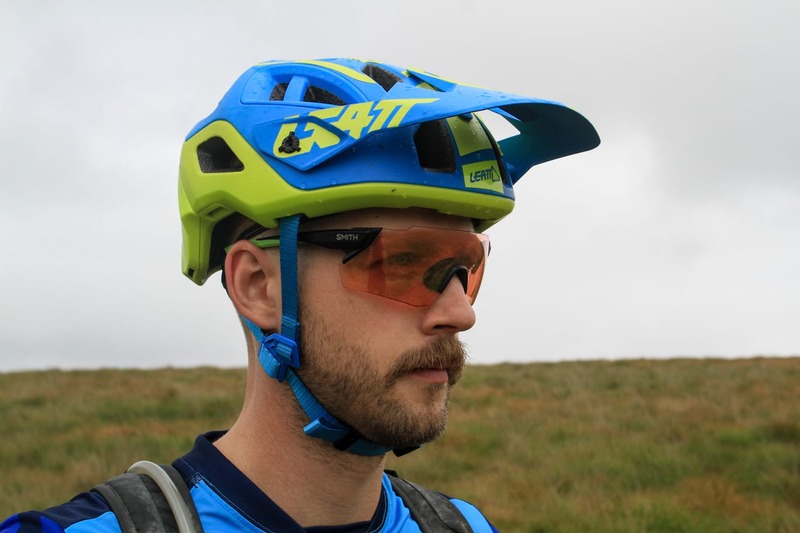 For riding rock-armoured singletrack around trail centres on overcast days, the Rose lens delivers a load of contrast and a nice crisp line of sight. And if the skies are falling, this is quite possibly the best lens tint I’ve used. It works wonders to boost colour definition, while still feeling very easy on the eyes. What I don’t like about the Rose lens is its weird ‘ghosting’ effect. This is something that arises if you get dappled light coming towards you, or light reflecting off of water and metallic objects. You end up with a sort of secondary 3D reflection, as if you’re trying to solve a Magic Eye puzzle. I’ve also had this confirmed by several other testers, who have all described the same issue with this lens, though to be fair, to differing degrees of annoyance. One rider found it made the lens virtually unusable, while I found it wasn’t that big of a deal. Your results may vary. There’s a Blue Mirror coating in the Rose lens, and it can cause some weirdness on the trail. “For the rose contrast lens, yes, we’ve heard of the issue from a couple of users and it’s caused from the blue flash mirror coating on that lens. We use a blue flash mirror for this particular product to ensure that the High Energy Visible (HEV) light is reflected away for the users eye in low light situations. Blue light is known to be the most harmful visible light causing the most discomfort for individuals (think of staring at your computer screen for too long). Furthermore, blue light bends more than other colours within the visible spectrum when going through any medium (this is the same phenomenon that makes a prism separate white light into all of its colours). It also vibrates at a much higher frequency. This excess of bending through curved surfaces and high vibration can create a slight blurring of an image through a lens (chromatic aberration). And because your pupil is generally much bigger in low light scenarios allowing as much light into the eye as possible, we use this coating to lessen the effects of blue light in high performance situations. The end result is less eye strain, sharper vision, less headaches, and less mental and physical fatigue. On overcast days, the ChromaPop Rose Flash lens is very good. So there you go – an explanation of why the ChromaPop Rose Flash lens does what it does. Unfortunately there isn’t really a solution to the issue, and as far as our collective experience goes at the office, this is the only lens we’ve encountered this phenomenon with. I will point out that you won’t experience this problem when riding on consistently grey days out – it’s only if the sun decides to come out and cause issues, typically if you get dappled light coming through the trees. It’s somewhat frustrating, because these lenses are so darn good on overcast days. If Smith was able to somehow reduce that ghosting effect, they’d have one of the best lenses going for low-light conditions. These are very high quality glasses with an ingenious solution for quickly and easily changing lenses. The field of vision is superb, and the quality and clarity of the lenses is instantly apparent when compared to lesser glasses. 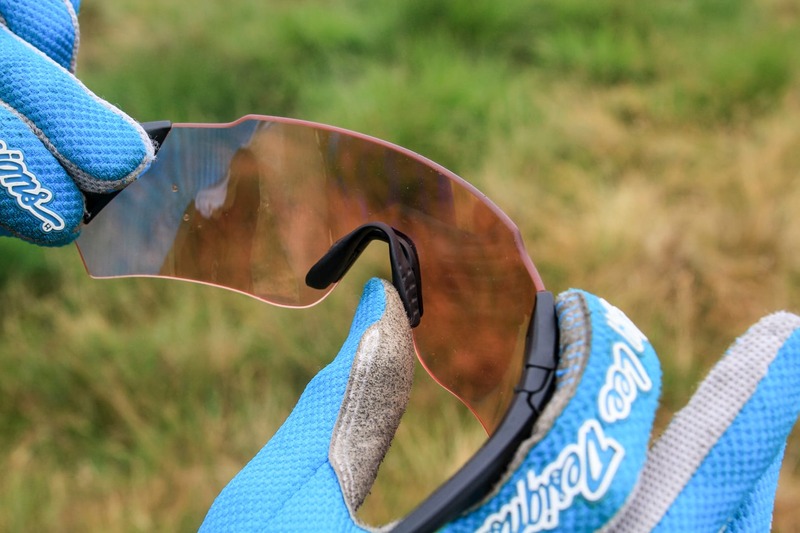 Unfortunate ghosting issues with the Rose tinted lens aside, the sharpness and colour-boosting contrast with the ChromaPop lenses is what separates these from most other cycling glasses, both in terms of visual quality and price. 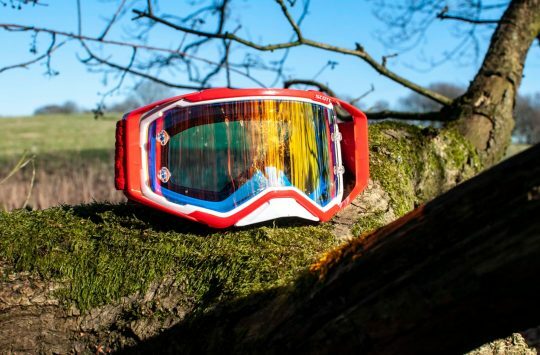 There’s no denying they’re priced high – if you normally get change out of a tenner when buying riding glasses, then these are definitely not for you. But if you want the best, then these are without doubt some of the nicest riding glasses I’ve ridden with.